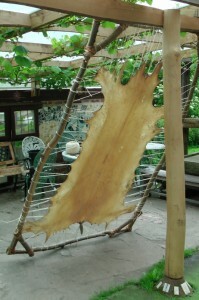 I wanted to make drums with Red Deer hide. I have an affinity with these animals from a variety of angles. For one thing, over the last year or two I've developed a deeper knowledge and respect for one of our native deities, Gwydion ap Don. For a variety of reasons, I've come to recognise him as our local representative of the widespread antlered Lord of the Animals. Also, in 2008, when we started clearing the land on which our roundhouse was to be built, I immediately stubbed my toe on a deer skull hidden in the tangled undergrowth. The skull is now buried in the NE corner of the roundhouse. Above it (left) looms a massive pair of antlers belonging to a great old Red Deer stag called Rufus, who lived in the same valley. A powerful, shape-shifting deer spirit is the protector of the roundhouse, while another potent antlered spirit cares for the whole valley. I have communicated regularly with both for the last seven years. Plus there are few finer natural sights in Britain than a Red Deer stag walking through a forest. And then, of course, there's the fact that I'm a wolf, and wolves certainly do like the strong, gamy taste of venison. My initial problem was to find deer skins. I read online that the skins and other unwanted parts of many deer farmed for venison are simply thrown away, either burnt or buried, because they are viewed as having no economic value. I asked on facebook if anyone knew of where I could obtain some of these skins. I got a response from Peter Tyldesley, who manages the deer herds at Bradgate Park, Britain's longest continuously operated deer park, dating back to the 14th century. He does make use of hides, antlers, etc., to the greatest extent possible. 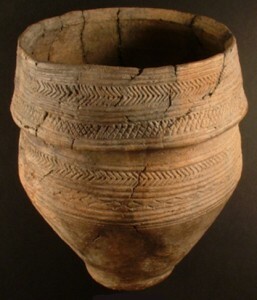 However, none of his hides had been used for drum-making. Peter gave me a good deal on five hides and they duly arrived. Four of them fitted into my freezer. The fifth didn't. One slightly panicked phone call later, I had arranged to travel to Wild Ways, the woodland retreat centre run by my friends, Elaine and Garth. They had all the space and equipment I would need to treat the hide. Never having treated a hide before, I resorted to the modern Druidical trick of appealing to the Internet. There I found a number of sites, some decidedly more useful than others. I discovered that a natural subst ance that can be used to de-fur a hide is wood ash. It so happens that almost all the heating at Wild Ways is provided by wood-burning stoves. Garth kindly sieved a quantity of ash for me to get out most of the charcoal and other impurities. The hides as Peter sent them had been well cleaned and salted. The first thing to do was to remove the salt. This was achieved with the aid of the brook that runs through Wild Ways, a tributary of the nearby River Severn, sacred to the native goddess, Sabrina. I tied the hide by its tail to an underwater root, weighted down the hide with stones and left it for a couple of days (left). In the meantime, I built a frame on which to stretch the hide and tried to find out how much wood ash to use. 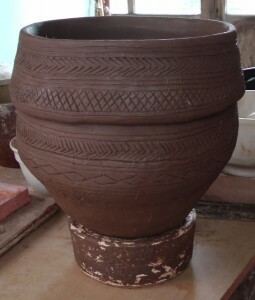 Eventually, one website gave me the necessary key: you mix wood ash with one gallon of water until a fresh hen's egg floats upright in it with a disc about an inch across showing. Brilliant! Then it was time for a body-painting weekend, but that's another blog. 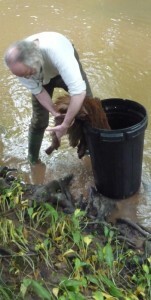 Elaine loaned me a plastic dustbin, which I took down to the brook to carry the hide in. I washed the river mud off the hide as best as I could, wrung it out and put it in the bin. A thoroughly soaked hide from an adult Red Deer weighs quite a lot. Elaine helped me carry the bin across the field and lift it over the gate, where we had a wheelbarrow waiting for the rest of the journey through the woods. 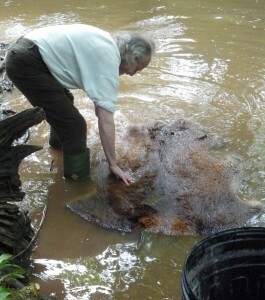 The natural tendency of a hide with fur on is to float, so it's necessary to weight it down with a flat rock. This then has to be left for a few days, during which time you take out the rock and stir the mixture with the hide around. The wood ash solution is alkaline. The effect it has is to cause the cellular structure of the hide to expand, loosening the follicles that hold in the fur. Test the fur every now and then. You'll know it's ready when you can run your hand across the hide and the fur just falls off. When this happens, pull out the hide and fully de-fur it. 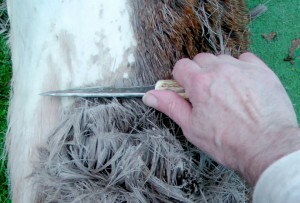 Because hides de-fur unevenly, you will probably need to scrape some of the fur off. A not-too-sharp knife works well for this. Put the hide on a flat surface, hold the knife so that the blade is at a little bit of an angle (as shown in the picture) and pull it towards you in even strokes, being careful not to apply so much pressure that you go through the skin. 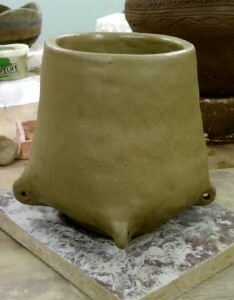 Then you need to flip it over and work on the flesh side (some recommend scraping the flesh side first). This needs to be scraped to remove any remaining bits of flesh and also to take off the layer of membrane covering this side of the hide. The wood ash solution should make this much easier. The worry is in knowing how far to go. Obviously you don't want to go so far that you weaken the skin. The key seems to be to take it down until the flesh side shows clear white. I don't think I'd left this first hide in the wood ash long enough because the flesh side proved something of a challenge. Back it went into the solution and back home I went for a few days while Elaine and Garth went to the 50th anniversary celebrations of the Order of Bards, Ovates and Druids. After which, they gave me a lift back to Wild Ways. More hide scraping on the flesh side, following which the hide was washed before going into another solution, this time of a handful of baking soda to four gallons of rain water. The idea of the baking soda is that it neutralises the Ph level of the hide after its long alkaline bath. 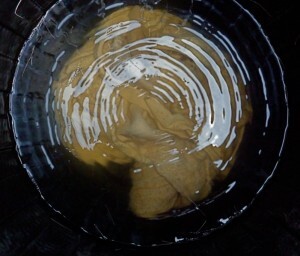 After an overnight soak in the baking soda (right) and some more flesh scraping, the hide was washed again before being placed in four gallons of rainwater to which about a 1/3rd of a pint of clear vinegar had been added and left for about eight hours, stirring occasionally. This has the effect of raising the acidity level of the hide back to something like it was when you started. 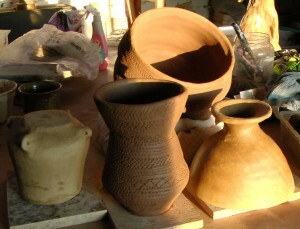 It also, usefully, takes away some of the strong smell the hide develops while soaking in the wood ash solution. Then comes the fun bit, sewing the hide to your beautifully constructed frame. Woohoo! If, like me, you're lucky anough to have a friend with acres of woodland, you can do what I did and find strong saplings to construct your frame. The small cross-pieces on the corners provide extra strength and help stop the frame twisting out of shape too much as the skin dries and applies more tension to the frame. The corners of the frame shown here are lashed with strips of ash bark, which is remarkably strong. While this looks really neat, I admit that most of what's holding the frame together is the screws I put in before the lashing was done. Some modern innovations are extremely useful. If you don't have access to woodland, 8' lengths of 3" x 3" from your local timber yard will do equally well, and that's what I've used for making my second frame at home. You can use pretty much any kind of string or twine to attach the hide to the frame. I used sisal twine because there happened to be a lot of it going spare. A very useful tip I picked up from the Internet is to sew on your hide in four sections, the head end and tail end and both sides. By using separate lengths of cord for each of these you make it much easier to tighten or slacken them off as needed. 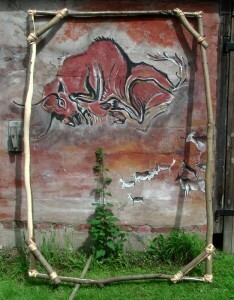 The frame I made at Wild Ways was about 8 feet high and 4.5 feet across. This looked huge, but proved to be only just big enough. It's called a stretching frame for a reason. The hide will stretch a lot. I'd seen an online video of a guy stitching a hide onto a frame, so I followed his lead, which was to use a small, pointed knife to pierce holes through the hide about a ¼ inch in from the edge of the hide. I was sure the wet skin would tear when I pulled the string tight. I was wrong. This stuff is really strong. Put your holes about five or six inches apart or wherever there's a point of skin sticking out. I started with the tail end. Having the tail still attached meant that I could tie it to the centre of the frame's bottom with a separate piece of string and use it as my fixed point. I then flipped the frame up the other way and started at the former bottom, now top, right corner of the frame and threaded the twine through each of the already-made holes, looping around the frame as I went. I did the head end next as the already tied tail end gave me something the pull against. 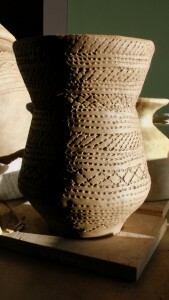 Same process. Make your holes first all the way across from one front leg to the other, then stitch and loop. Then I flipped the frame back the other way and did the same for the two sides. At this point, check the tension on the strings. This is done simply by twanging them with a finger. If they are floppy, they need tightening. If you get a good, resonant twang, they're fine. To tighten, work from one end of your side, top or bottom cord, pulling the cord through each threaded hole in turn as you go. At the far end of each run, undo the cord where you tied it in place, take up all the slack you've just created and tie it again. Do this all round until you're happy that you've got all the strings as tight as you can. Don't be afraid to tug quite hard. This is very tough stuff. Then leave it for two or three days to dry, checking the cords every once in a while to make sure they're still tight. You'll probably find they're tighter. After only about a day, my hide was so tight that it was already starting to sound quite drum-like. This is a good sign. While all this was going on, I'd been finishing off two drum hoops I'd made at Wild Ways some time before. These were looking really good. The timber they are made from is Ash, a beautiful, pale wood. As is my habit, I'd rubbed linseed oil into them. This acts as a preservative, brings out a really nice golden glow in the wood and makes the grain stand out clearly. One of the last parts of my hoop-making process is to drill five small holes and thread rawhide through them in the form of a pentagram. This helps hold the already glued ends of the hoop together and is also my 'signature' (right). With the hide drying nicely on the stretcher frame, I held the two drum hoops up against them and realised that, with care, I might get two drum skins out of this one hide. Woohoo! I've been meaning to record this Wolf Chant for years. It came to me after Ellen Evert Hopman brought a Seneca Wolf Chant to one of our Gorsedd circles in Avebury in 1994 or 95. I thought I'd memorised it, but next time I sang it to some other people who were at the Gorsedd, they told me I'd got it wrong. They taught it to me again. This time, I was sure I'd got it right. However, I was told I'd got it wrong again. This happened about four times and then I realised that what had happened was, I'd taken the inspiration of the Seneca chant, filtered it through my own spirit, and come up with an original, native British Wolf Chant. I've been singing it ever since. One of the most memorable times I sang it was ten years ago in the Drum Circle of the Quileute people on the Olympic Peninsula on the Pacific Northwest coast. When I sang it in the Circle, I had no idea that the Quileute are descended from shape-shifting wolves. I also didn't know that one of the tribal elders had foreseen my coming five days earlier. The chant created quite a stir and my two sons and I were made members of the Drum Circle. The chant is part of my regular spiritual practice. Working with spirit wolves, it helps to keep me in touch with them. It is a gift to be used by anyone who wants to connect with the spirit of the Wolf. I've also always felt that it is a spirit call for wild wolves to be reintroduced into Britain, something I very much hope to see during my lifetime. 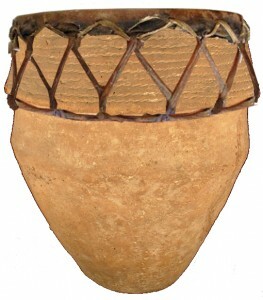 The drum I'm playing is the first one I've ever made. The hoop or frame is of Ash, the skin is the hide of a red deer from Britain's oldest deer park, dating back to the 15th century. 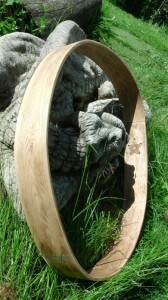 It was quite a journey making the drum, from felling the tree, through treating the hide to lacing it onto the frame. The film consists of footage shot at the Avebury henge the other day by my son, Mike, cut with other footage and some stills I shot in and around Avebury myself a few years ago.